Prepare different pasta sauces. There are many different kinds of Del Monte Spaghetti Sauce that you can choose from--from something on the sweet side to something more faithful to the Italian taste, all of them delicious. Making and serving pasta will be more exciting, never boring. It is fun mixing and matching pasta to sauce. Try spaghetti with Del Monte Creamy and Cheesy Spaghetti Sauce and elbow macaroni with Del Monte Filipino Style Spaghetti Sauce. Plus, find inspiration from places like Pinterest on how to make each recipe a treat for the eyes just by arranging the elements a certain way! 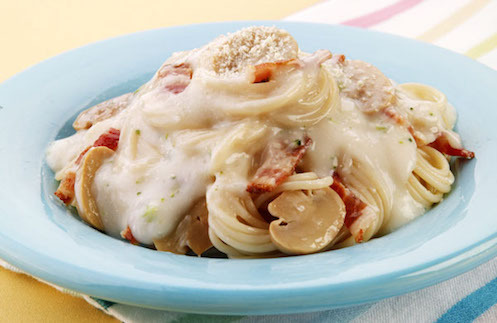 Pasta is a very versatile dish when it comes to ingredients and toppings. The default protein is ground beef, but you can always opt for pork, chicken or seafood. Are you doing a breakfast-themed pasta? Then add some bacon and eggs. Are you going for a pop of color? Sprinkle some fresh basil and don't scrimp on the cheese! When people think of a pasta dish, they immediately think of a heavy tomato-based entree with lots of spices and meats. But pasta can also be served as appetizers, salads, soups and stews. 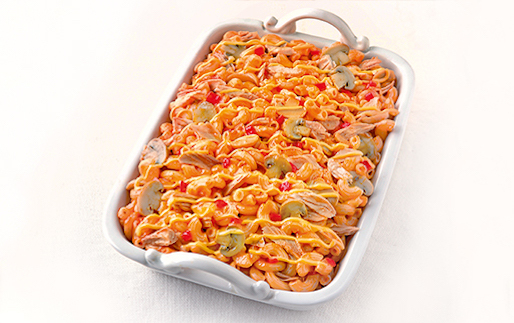 Our favorites include traditional chicken macaroni salad with a medley of colors and flavors; and chicken macaroni soup.